Affordable and great sounding windblocker speakers are now available for your 1999-2005 Miata! 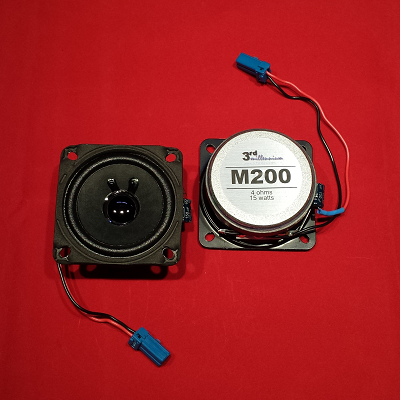 Our M200's are a direct drop-in replacement for the stock (Bose or non-Bose) speakers. Crossovers and wiring harness adapters are already attached so it's a simple screwdriver installation. No cutting, drilling, or splicing of wires necessary. It's plug and play! Of course, not every NB Miata came with windblocker speakers but if you can locate a windblocker in a salvage yard, it will screw into any 1999-2005 Miata allowing you to get even better top-down audio. Note that if you find a windblocker that was part of a Bose model Miata, it will work fine but you'll need to bypass the small amp in the windblocker to carry your stereo's signal directly to the speakers. And the sound is a huge improvement over stock. The M200 is a substantial upgrade which lowers the crossover point down from the stock 4,500 Hz to 250 Hz allowing warm, natural vocals and instrumentation. And with a generous 15 watt power rating (30 watt peak), the M200s work great with stock stereos or high-powered aftermarket amps and radios. Installation literally takes minutes and only requires a screwdriver as the M200s are an exact fit and use the existing speaker screw holes. And with our included pre-attached crossover and harness adapter, you simply plug them in to the stock factory wiring. There's no splicing, soldering, crimping, drilling, or struggling to install. Check out our YouTube video showing how simple the installation is. Larger magnets than the original factory speakers and are rated to handle a larger 15 watts of full-frequency power each compared to the oem speaker's 8 watts DIN. The frequency response is an impressively flat 200 - 17,000 Hz +-6dB. When you order you will receive (2) brand new M200 speakers. We offer a 30-day 'no questions asked' money back guarantee and a full 1-year warranty. "I’ve just finished the installation and...ESPECTACULAR!!! Congratulations for this high quality product strongly recommended. ", Gabriel, Madrid Spain"